The makerspace isn't just a fixed space where kids come and go to complete busywork. It's an extension of a well-established approach to educating students that has applications and deep implications across disciplines. 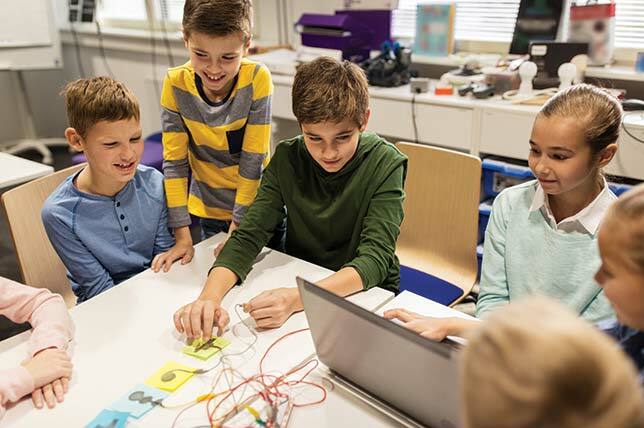 As makerspaces start to pop up in schools across the country, some educators, particularly those teaching non-STEM subjects, may be wondering what exactly they're supposed to do with them. Policymakers and administrators, meanwhile, want to make sure the spaces and resources are well utilized and are providing as much educational bang for the buck as possible. Luckily, integrating makerspaces throughout the curriculum is fairly easy with the right frame of mind. Though the term makerspace is fairly new to education, the learning theory underpinning the makerspace use — constructivism — is among the foundational theories most teachers are trained with, explained Trisha Roffey, emerging technology consultant and teacher for learning services innovation at Edmonton Catholic Schools. "Constructivism equally applies to any subject area because it's the whole idea of learning through doing," Roffey, who also runs the site makerspaceforeducation.com, said. "The foundational pedagogy actually transcends a specific subject area because in its essence — when it was Jean Piaget and Seymour Papert and John Dewey talking about this it was about the whole system, the whole structure of education that could be transformed by this methodology." And makerspace projects don't always have to be about producing a tangible project. Roffey said she loves Rube Goldberg machines made from, essentially, a table and trash for $5 and talks about how excited students get making a flight simulator with a power glove made from a kitchen glove, tinfoil and a Makey Makey, but the simulator itself existed in Google Earth and she's just as happy to talk about social studies projects that ask students to create virtual tours of Tunisia, Peru or the Ukraine instead of writing a book report. Taking that approach also allows for a much broader definition of what constitutes a makerspace. "In my whole career I have never had a 'makerspace,'" Roffey said. "I've never had a dedicated room. I've been doing this for six years now, and I've always had carts and bins and baskets. So I think what people need to realize is that this doesn't necessarily mean you need a $50,000 grant. This can be done with 50 bucks and a plastic bin and a Raspberry Pi and some tinfoil. It's more about transforming your approach to teaching and learning and student inquiry." She added: "Anybody and everybody can do this. It's any budget, anywhere, any ability of student. Don't just keep this for your best and your brightest. This really is for anyone. And I think the humans have been inquisitive since we made fire. And so I just think we can use makerspace to make fire in our classrooms again — to bring that learning alive and to give that a chance. Even if it's just for one day for one project … to just see the magic that can happen when you let kids be able to make fire." Hanna Shekhter, director of STEM innovation and education at Brauser Maimonides Academy, said that introducing students to engineering and building things in the classroom can help them to develop the soft skills that they'll need in their careers, regardless of what those careers might be. "When you're in the STEM fields, when you're a computer science major, you rarely work in a bubble," Shekhter said. "You must work with others and you take your piece, and you have to fit it in with their piece, and that's an important part" of being effective in any career. "When you go to Apple, when you go to Microsoft and when you go to laboratories, that is what they look like," Shekhter added. "It doesn't help us to sort of compartmentalize their learning and put them in lines and rows and have each one do the same exact project and write the same exact papers." Michelle Schira Hagerman, an assistant professor with the faculty of education at the University of Ottawa, studies literacies and explains that, while there is value in disciplinary literacies, there is also a need to teach students how to transcend those particular approaches. "Disciplines exist because there are particular ways of thinking about problems that are disciplinary, and, to become a master of solving a scientific problem, let's say, one does need to have many, many, many opportunities to practice thinking like a scientist," Hagerman said. "Knowing that scientific method, or knowing how to think like a scientist about problems, is important. It has to be a part of every student's mental toolkit because when there's a problem, that scientific method may indeed be exactly the approach that one should take to solve the problem. Same with history or social studies. There are all kinds of ways of thinking or heuristics that historians apply to solve problems that are historical, or to construct an understanding of the past in ways that can help to inform the present." "I don't think that it would be wise, necessarily, to not have disciplines where kids can go deeply into the mastery of those disciplinary ways of thinking, but I don't think that it should stop there. History class should not necessarily just be about learning to think like a historian, it should also now include the juxtaposition of the historical way of thinking with other ways of solving problems." Hagerman said that there are real, practical, nuts and bolts reasons for kids to practice combining these different ways of thinking. "I think the whole question of the reciprocity of arts and science and science and arts, at the center of it is the notion that today the people who are probably best suited to be successful in the world are people who can leverage a range of ways of solving problems, who have had a diverse set of experiences through a range of projects and activities in school and out of school who can bring these multidisciplinary lenses to bear on any problem they want to solve," Hagerman said. "And we know, of course, that the arts enable students to understand themselves as creative actors, that the arts enable a different sense of self and a different identity and a different sort of connection to different kinds of problems. I think that in that kind of reciprocity there's real power." Roffey explained that makerspaces are an elegant solution to bringing all these different strands together. She said that we have to expand our definition of literacy beyond simply being able to read and write. "We have to understand that if we're really going to create literate adults in a fully functioning way in our world, then they have to be media literate, digitally literate," she said. "These are things that are going to be crucial to their success in the real world regardless of what they do. When we can look at literacies in the sense of, 'Can you navigate and filter information? Do you know how to be able to collaborate with other people and bring your strengths to the table?' When we start to break down some of those things makerspaces really let us create a petri dish of the real world." Shekhter said that the inspiration for these kinds of multi-literacy projects in her school comes from a variety of sources. In the course of her work as the computer science teacher, she visits different classrooms throughout the week and uses the visits to check in and find out what the students are up to. Between those visits and informal conversations with other teachers, she finds opportunities to "liven up" a unit with a tangible project, like when students learning about cells made models of organelles or when students reading a novel about a child with a missing hand used the school's 3D printer to design a prosthetic hand. Other times, as in the case of a class reading <<ital>>Touching Spirit Bear, <<text>>another teacher will hear students getting excited about a technology — in this case the 3D printer again — and will ask her about integrating it with the lessons. For this particular novel, which is set in a Native American community, the students designed their own totems on computers and then printed them out. Roffey echoed this idea that enthusiasm for projects is contagious in a school. "I think what you have to do is you have to start with a champion, and you have to start with passion," she said. 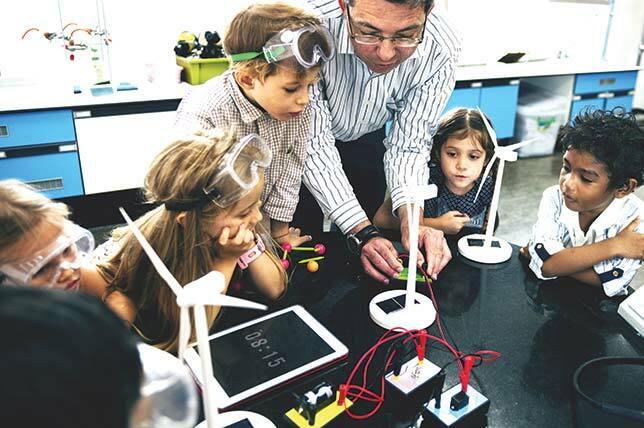 She explained that the best uptake she sees for makerspaces in schools comes after a staff maker day in which teachers are given access to a mix of no-tech, low-tech and high-tech tools and a set of curriculum-based challenges." Hagerman also said that teacher professional development could be improved to better support this kind of approach to teaching. "It's very rare, I think, that teachers get the freedom to just sort of play around with stuff," she said. "We're knowledge workers as teachers. You need time to just put the ideas together. And when the professional learning feels kind of pressured or driven by some agenda that you might not even agree with in the first place, and you don't see why it's relevant, it's not going to have the impact. And so, fundamentally, I think that directors of education, policymakers, need to think about creating learning experiences that truly empower teachers, that truly empower them to lead, because these are people who are creative; they're innovative; they're passionate; they're committed to supporting kids and so they deserve to have professional learning that meets their needs." "I think the big question I have for teachers is, 'Why not?' Let's just give it a try," Roffey said. "I know that there's the way we've always done things, but if we just relegate makerspace to STEM or science or math, I think what we've overlooked is that it has already existed in other curricular areas since human beings started creating anything."